I've been working on making a build environment that has everything needed to do Papilio development already installed and ready to go, including the Cloud9 IDE. This is a rough start and still needs a lot of work but might be worth checking out. Do the following to get it up and running on your local machine. This will give you an ip address under the URL column. Once you are in cloud9 you will have to upload a Xilinx.lic file to the ~/.Xilinx directory (There is a upload tool built into the file menu). 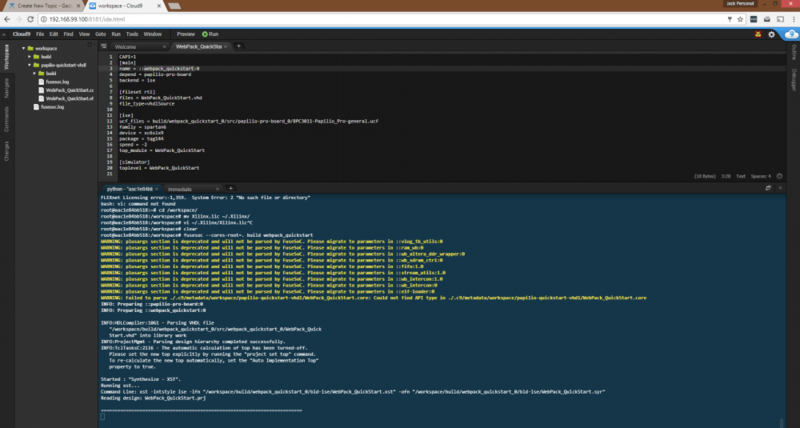 You should see the project build in the terminal window and you can navigate to the project source files on the left. Once the build is done you can right click on the bit file that is generated, download it, and run it on the papilio pro board. Still needs a lot more work, but is a pretty cool start! Sounds promising. I will hopefully try it out soon. I'm not familiar with Cloud 9, does it have an editor with VHDL support? I think the final target of your effort a cloud build environments or "casual users". For a local development workflow there is not really an alternative to have access to ISE and the isim gui to analyze and troubleshoot the code. On my local machine currently I use a combination of Geany as a lightweight editor with VHDL and build support, FuseSOC and ISE/isim. It works quite well. Maybe one day I will learn enough tcl do write a script which updates a FuseSoc core description with the changes from ISE (e.g. adding a source file). After taking a look at the Coud9 website I'm still a bit confused how things are setup, e.g. what runs in the cloud and what locally. I have seen that you can create a SSL connection between the build/tools machine in the IDE. Does this require a unique public IP address? Maybe you can outline the deployment setup you aim for. Think of it as a lightweight virtual machine, it has all the tools needed pre-installed but without the need to include the OS. Xilinx ISE, fusesoc, zpuino toolchain, a local version of cloud9, and could also include your bonfire toolchain and the arduino toolchain. It has everything pre-installed and configured to build bit files for the papilio board. If I had done this with virtualbox then I would have to include the OS inside virtualbox, we would easily be pushing a 30GB download really quick. With Docker we can setup a VM that does not require the OS and has the benefit of a centralized repository and compresses the download. If I remember correctly you only have to download 4GB or something like that for this setup. Try it out, its magical. Ok, I was not aware that there is a local version of cloud9, my understanding was always that you need to connect to their cloud. I have some basic knowledge about docker, but not really experience with it. What you describe is hopefully a good way for people who want to "consume" reproduced FPGA IP, maybe reconfigure it a bit. When you need serious debugging you will at the end require at least the isim gui. I think a good IDE together with FuseSoC can easily replace ISE, but not the simulator/debugger. I hope I have a chance on the weekend to try it out. I was able to start the container now. So on a first glance it works. But I'm still fighting with Docker, it runs only with sudo (as root), which also means that all worksapce files are owned by root. Most commands in the docker documentation didn't work, neither "docker-machine ls". The different docker versions/editions seem to have different commands. Can you tell me what docker version and eidition you installed? Works really well. I think I will also add ghdl to it, than I'm finished. The only "drawback" I see with the current image, is that it runs only as root (I have tried the --user option of docker, but than it does not work correctly). Running with root means that using the image will clutter the users home directory (which is mapped to /workspace as volume) with lot of files owned by root.Have you build your image with a Dockerfile or "interactivly" with docker commit? Another question: Are you sure that Xilinx has no problem with providing a Docker image with ISE installed? Is releasing it without a license key "enough"? 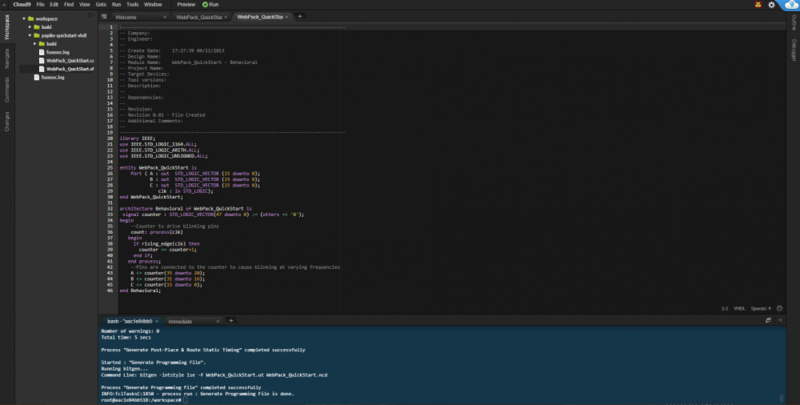 The IDE is not as slick as the cloud9 IDE and there is no default support for VHDL and Verilog files. But, it looks like it uses the same standard as the VS Code so we can pull those modules into Eclipse Che and have nice support for not only VHDL/Verilog, but also code snippets, templates, and builders/wizards for ZPUino and Bonfire. I think it looks straightforward to get a graphical wave viewer supported too for simulations. I really don't know. I started down this path because I noticed that Xilinx has released an Amazon AMI (virtual machine) that has Vivado pre-installed and direct people to run the licensing tool after they start the AMI. I figured that if they were doing this then they must realize the benefits of this type of approach for their customers... Maybe they will shut it down at some point, but I have a backup plan. I'm thinking to develop an "agent" that will run on your workstation and that will be called from the cloud instance. When you invoke it, it will download all project source files, synthesize on your local machine, and upload the results back to the cloud server. Ultimately though, if Xilinx will not allow this type of use case then I will be migrating Papilio boards away from Xilinx and to other vendors that do allow it. I'm not sure, one of the downsides that I'm worried about is that maybe docker is too complicated for some people. Docker is indeed not intended for "End Users", it is a product for DevOps professionals. Do use it you need also understand basically how it works. For example it is not a got idea to always execute the docker run command you mentioned above every time, because you will fill up your machine with containers. It is better to use only docker start/stop after the initialization. It helps of course to bundle independent software packages (e.g. ISE, fusesoc and the gcc toolchain for your favorite soft processor) into a reproducible environment. But it has also a lot of drawbacks. The question is what you want to reach. The cloud9/Docker approach would make senses when combined really with the cloud version of cloud9, running also the builder in the cloud. Combined with maybe some "extended" version of fusesoc to configure e.g. the slots of zpuino. For people that want to use the FPGA as a "super-flexible" Microcontroller instead of diving deep into FPGA design. In the meantime I have switched the workflow for Bonfire to FuseSoC. For editing and debugging I use ISE, but only on the project generated by FuseSoc (with the --no-export option). So i can use the comfort of ISE and isim, but have always a project structure which I can easily reproduce on a new computer/VM. I'm always trying to have an environment which I can recreate in a few hours. In the past I had often a development machine, maintained over years where I simply didn't know anymore how it was setup and was therefore also not able to break down the prerequisites of a project. Nowadays my development VMs are usually only a few weeks or months old and I frequently create new ones. So I will not update my Vivado 17.02 VM to 17.03, I will create a new one from scratch and move all my work over. I never install anything besides Office and a Web Browser on the host system (which usually is Windows). fusesoc helps a lot, because it is a tool chain agnostic method to organize and package HDL projects. BTW: I have started with the zpuino UART to isolate it and extract it to a FuseSoC project, I will post details soon. I like the idea of having a VM to avoid all the install hassle. I finally setup a kubuntu 14.04 VM with DesignLab and ISE. I can offer that VM in case anyone wants it - however the license would have to be removed first. I ran your docker container as explained here and got cloud9 running. How can I run DesignLab and ISE? Is that possible? With ISE it should be theoretically possible, because it is a X Windows application. So setting the DISPLAY env variable in Docker and enabling access to the X server from the container should make it working. I have not yet tried this on my own. This will start ISE in a window and ask for the license file. In order to provide your license file the License Configuration Manager (xlcm) has to be run. To make this work the package libqt4-network and a symlink are needed. I created a docker image providing these modifications. This enables to run ISE with correct license. docker run -e DISPLAY=$DISPLAY -v /tmp/.X11-unix:/tmp/.X11-unix -v $(pwd):/workspace drtrigon/papilio-environment-ise bash -c "/opt/Xilinx/14.7/ISE_DS/common/bin/lin64/xlcm; ise;"
This will first start the License Configuration Manager allowing you to add your Xilinx.lic license file (load it from /workspace directory). After you close that dialog it finally starts ISE in a window. Hope that helps someone else too. Incredible to me is the fact that the whole build environment suits into a 2 GB docker image (5.88GB on the local machine) while the download of ISE is around 6 GB and the installations needs something around 20 GB. That's very cool IMHO! Thanks Jack for starting this! What are your future plans for this docker environment? 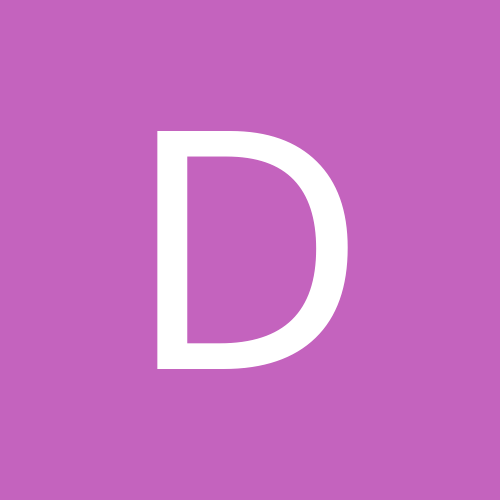 docker build -f Dockerfile.DesignLab -t test:latest . docker run -e DISPLAY=$DISPLAY -v /tmp/.X11-unix:/tmp/.X11-unix -v $(pwd):/workspace test:latest bash -c "/opt/Xilinx/14.7/ISE_DS/common/bin/lin64/xlcm; DesignLab-1.0.8/DesignLab;"
Awesome. I will check it in the next days.